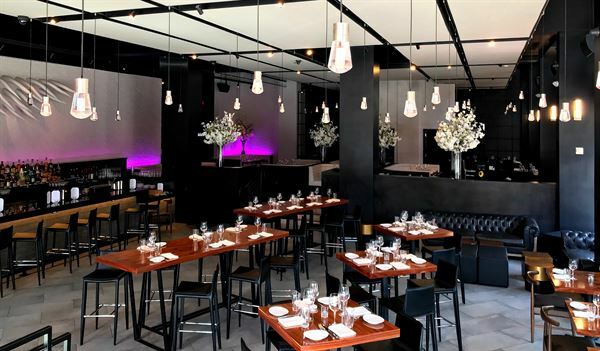 Located in the Andaz Hotel San Diego - Gaslamp Quarter, STK offers guests a fresh, modern alternative to the conventional San Diego dining experience. The seasonal, innovative menu, along with the sophisticated, stylish décor and decidedly lively and sultry atmosphere, lets guests know that this is definitely “not your daddy’s steakhouse.” STK San Diego is comprised of several discreet spaces, unified by a common design vocabulary and its sense of energy and intrigue. Ceilings soar in the main dining room against a backdrop of unadorned white brick with glass globe lights floating like stars throughout. Seating is banquette style, low and designed to engage a social atmosphere. The color and material palette runs from pressed black crocodile to creamy white leather. STK San Diego offers the full experience from incredible cuisine to breathtaking cocktails that are truly one-of-a-kind.
? This open air atrium can be used for a seated dinner, buffet dinner, happy hour or a cocktail reception with passed hors d’oeuvres ? This room can hold up to 50 people for a seated dinner or 60 for reception. ? Features and private built in bar.